Hammocks are so last year, introducing Kodama Zomes! It’s part art sculpture and part hammock, but mostly it’s a whole lot of luxurious lounging. We give you Kodama Zomes! 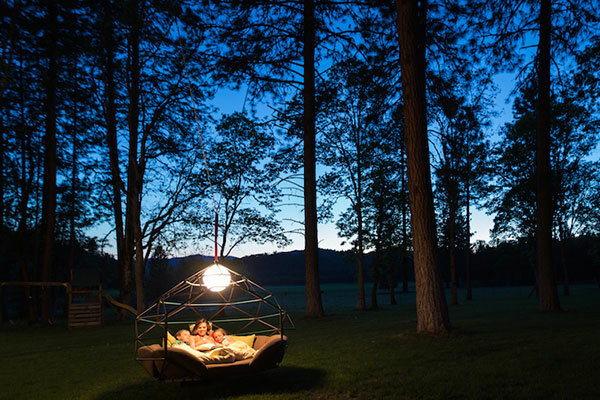 A geometric cocoon of relaxation, the Kodama Zome is a creation of architect Buckminster Fuller. These amazing chairs sway in an unrestricted pendulum motion when hung from a sturdy tree or an overhead beam, allowing you to swing in the gentlest breeze (feeling relaxed already, yes?). The popular ‘Pod’ size zome (US$4800) is perfect for one to three people, though zome sizes up to a 275 centimetres in diameter are also available – just in case you’re super tall or have lots of children that want to relax with you. The addition of the Curved Tripod Stand (US$1800) allows you to take the Kodama Zome and set it up pretty much anywhere your heart desires. The garden, the pool, the beach – even indoors (should you be lucky enough to have the space). Of course, the Kodama Zome isn’t for the average person’s budget, but included in that price tag is everything you need to lounge in serious style – the zome structure, mattress, wrap-around cushions, large back pillow, upholstery fabric and storage cover. 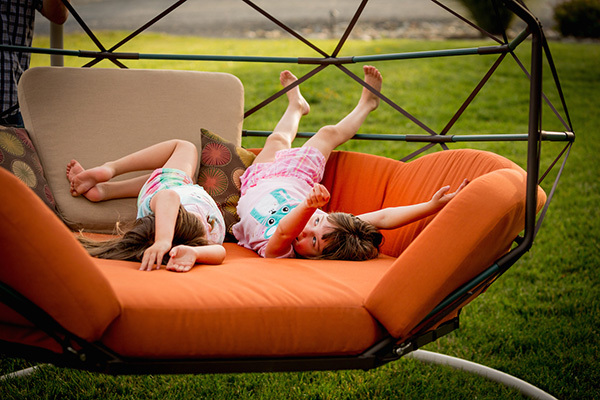 Alas, these zome swing chairs aren’t shipped to Australia, we can still dream! Head to Kodama Zomes for more information.